Picasa is a photo management software from Google, and it’s one of the best photo management tool in the market nowadays. 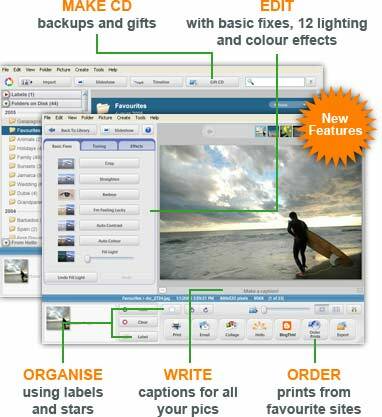 With tag line Picture Simplicity, Picasa packs a lot of advanced features, yet user friendly and ease of use. One of the feature in Picasa is that you can directly send your photos and media files, including audio and video from Picasa 2. When sending photos, Picasa automatically re-sizes and attaches pictures to email messages at sizes your friends will be able to open. Select the photos that you want to send to your friends. Click on the Email button at the bottom toolbar. After clicking on Email button, you will see a “Select Email” screen, which allows u to select one of the 3 ways to send email. Using your default email program with the name of your default email program, such as Microsoft Outlook, Microsoft Outlook Express, Mozilla Thunderbird and etc. 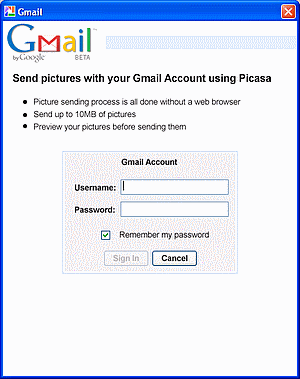 If you choose “Using your default email program”, Picasa will launch the email program that it specified on screen, automatically resizes and attaches the photos and media that you have selected to it. From there, you can modify your email, select email recipients and then send the email to your friends. If you choose Gmail, you will be asked to login to Gmail. After that you will see a interface that very similar to Gmail compose screen, with your selected photos readily attached. From there, you can type the emails of your friends (don’t worry, it works much like Gmail, with auto complete function, where entries in your Gmail address book that match what you type will automatically be suggested), edit the email and type whatever you want to say, and then send the email. Maximum size of attachments (mean your photos) that can be send is 10 MB, provided your recipients can allows this kind of size! 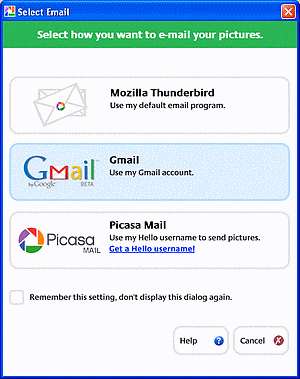 If you select Picasa Mail, you will need to login to your Hello account. For this, you need to register a Hello account. Hello is much like a instant messenger for photos, where you can instantly send dozens of pictures to your friends and talk about them, and also publish pictures to your Blogger blogs. After login in, you will see screen much like what you see in Sending by Gmail screen, just that now the email will appear as from your Hello account. After finish editing, click on Send, and your email is on the way to your friends to share the joy. Picasa will show a progress bar to show the status of sending.